A country with incredible history and culture, Italy is one of the most popular destinations in Europe. Home to an almost endless list of must-visit locations and landmarks, as well as stunningly beautiful natural scenery and coastal areas, this country has so much to offer. In fact, with such a lot of options to choose from, planning a trip to Italy can be quite a challenge. Rome offers all kinds of historical monuments like the Coliseum and Roman Forum, Venice offers its romantic waterways and gondolas, Pisa is world-famous for its 'Leaning Tower', Naples is a gorgeous city just near the ancient ruins of Pompeii, and the list of incredible Italian cities and touristic spots continues on and on. If you’re looking for an Italian vacation with a difference, it might be a good idea to consider an Italian river cruise. Many European cruises simply sail around the coasts of countries like Spain, Portugal, France, and Italy, but European river cruises can be an exceptional way to admire the continent’s breathtaking beauty from a new, unique angle. For a long time, the rivers of Italy weren't seen as a prime cruise location, but various lines have started running cruise routes through the country in recent years, and Italy river cruises have proven exceptionally popular with travelers of all ages from all around the world. If you're looking for a little slice of 'La Dolce Vita', an Italian river cruise could be the perfect option. If you’re looking for a river cruise in Italy, Venice is the place to be. The romantic city is famous all over the world for its waterways and nearby lagoon, so it’s definitely the best place to enjoy Italy by boat. Various river cruises can be enjoyed in and around Venice, so be sure to read on to learn all about them and decide which one sounds right for you. The 'Gems of Venice' Italian river cruise from CroisiEurope River Cruises is a five-day cruise at a very reasonable price per night. It begins in Venice and explores the full Venetian region. 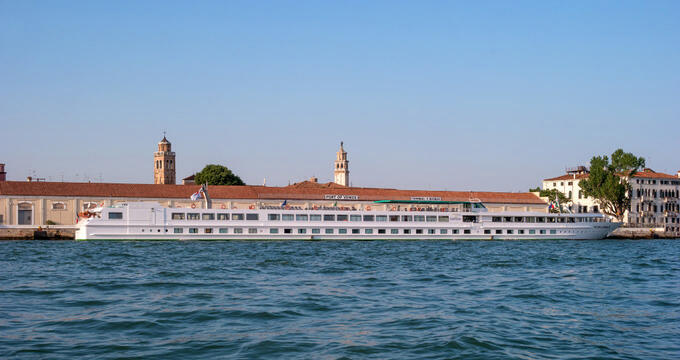 Guests will climb on board the stunningly beautiful MS Michelangelo and set off for stops at Burano, Murano, Chioggia, Padua, and Arqua Petrarca. The tour is fully suitable for guests of all ages and offers a full, in-depth exploration of Venice that you'll never forget. This eight-night tour gives guests three nights in a hotel at the foot of the Dolomites mountain range before heading off on a five-night cruise of Venice and the surrounding waters. Several excursions are featured in this Italian river cruise including a hike around the Dolomites, a visit to the beautiful city of Ferrara, and stops at the Venetian Lagoon islands of Burano and Murano. This is a wonderful trip for people of all ages, offering a land-and-sea combination tour of some of the most beautiful parts of Italy. The 'Gems of Northern Italy' from Uniworld is one of the most extensive Italian river cruises and one of the best-rated too. Past passengers have really fallen in love with every aspect of this river cruise, which starts in Milan and ends in Venice. The cruise runs for 10 nights in total, calling at Sant'Ambrogio di Valpolicella, Venice, Chioggia, Polesella, Bologna, Ferrara, Taglio di Po, Burano, Island of Mazzorbo, and Torcello. There's no better way to appreciate the sights and experiences of northern Italy. Another Uniworld cruise, this one runs for eight days in total and takes in the beauty of Venice, Chioggia, Bologna, Ferrara, Burano, and several other destinations all around the area. It's an adult-friendly cruise with a calm, intimate atmosphere on board the River Countess ship and lots of fascinating activities planned for each day. This family-friendly option is one of the best value Italian river cruises. It begins in Venice and takes in several islands around the Venetian Lagoon including Burano and Murano, as well as making half a dozen other stops along the way, giving passengers plenty of possibilities to explore and enjoy the sounds, sights, and tastes of this beautiful part of the country. Enjoy an authentic slice of northern Italian life with this unmissable river cruise.